OldTvHistory posted this video on YouTube; they say it is a sample of the earliest surviving colour videotape recording - of Dwight Eisenhower's inaugural address on WRC on May 22, 1958. Look below for the sample of this videotape. You might want to skip ahead to about 1 minute 18 seconds - it contans a classic TV moment, as black and white gives way to living color. This is sample footage of the earliest surviving colour videotape recording which is the Dwight Eisenhower inaugural address to WRC-TV on 22nd May 1958. 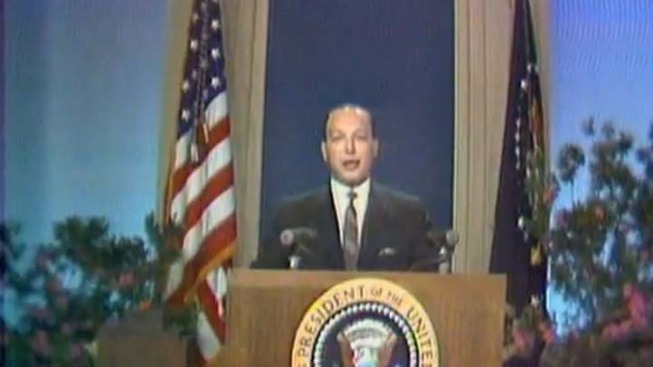 The first 15 minutes of this event was shot in B&W which you see the president arriving to the building and the news reporter giving details of the event, then about nearly 15 minutes in Robert Sarnoff hits the colour switch and on comes the colour. For the remaining 15 minutes Robert Sarnoff, Dwight Eisenhower and David Sarnoff speak about the station and the colour television technology while being recorded in living colour!!! The whole program is available for download in DVD quality from a user on Veoh right here http://www.veoh.com/browse/videos/category/news/watch/v191020606nr3MbJG . In the sample I've included the B&W portion where the president arrives and the colour portion which Robert Sarnoff and Dwight Eisenhower speak. USA started broadcasting colour in late 1953 and colour TV sets were available to the public in 1954 at an expensive price. Colour videotaping began in USA in 1958 and this footage is the earliest known to exist and it has been successfully transferred to digital for preservation. It is totally awesome to know that some colour programs from the late 1950s have survived on colour videotape as they show to us younger generations how good colour television really was back in its earliest days!!! Those RCA TK-41 cameras gave brilliant pictures back in the day!! !